Even the most prolific power pop bands deserve a break once in a while. So, why not perform some cover songs just for fun, right? The Connection have done just that with their new release. While it won’t change the world (cover albums just don’t do that), The Connection Just For Fun is the shot of adrenaline one needs to get through the winter (or last until the next Connection release). The best covers albums contain two things. There are the hits of years gone by – songs that may have defined your youth. Then, there are the tunes that you somehow missed while deployed, having kids or otherwise finding yourself. With Just For Fun, The Connection have given us both here. Songs like Bob Seger’s “Get Out Of Denver”, Cheap Trick’s “Southern Girls” and Buddy Holly’s “Think It Over” are excellent choices. While each is performed within the framework of the original work, The Connection’s unique sound adds a new, celebratory element to the proceedings. Dave Edmunds’ “Other Guys’ Girls” is one of my all-time favorite songs. It’s always a dangerous thing when one attempts to cover a song this good. Yet, the band goes a commendable job with this one, too. But the cover of Lonesome George Thorogood’s “Get A Haircut” is the real highlight for me. While it was a minor hit in its day, this song is one of pop music’s forgotten gems. Fortunately, there are bands out there that care enough to bring them back for an encore. That’s not the only payoff here. One of the best tracks I’ve heard in a while, Gary Lewis and the Playboys’ “I Can read Between the Lines” is a new one for me. I’d never actually heard this one before. Somehow, it must have gotten lost in the white noise of life. One of the joys of life is discovering new music, even if it is actually old music recycled for a new day. 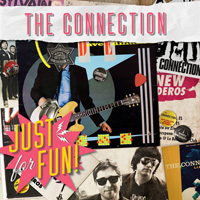 The Connection Just For Fun is available as a digital download or in physical form (CD). As with last week’s featured album, The Cheap Cassettes’ All Anxious All The Time, you can get this one at Rum Bar Records.